Returns are accepted if there is a grave mistake in the description, so please, read it carefully and look at every photograph, as I note every detail and flaw. Authenticity is 100% guaranteed on any logo, brand or marked items, so that you may bid with total confidence, or as always, a full refund if not extremely satisfied. With magazines, all articles are for sale by scan or email per page. Two strands of beads & pearls from a flapper dress. Great for so many uses. Create jewelry, attach in your hair, hook onto ear wires or just hang them. They measure about 15" long. They're pretty strong when pulled, but I wouldn't "yank or tug" them. 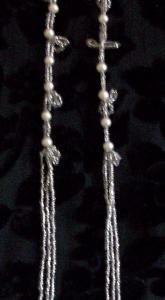 11 pearls, 6 sets of 2 beaded loops and 3 long strands of silver beads at the bottom. Years ago, I'd acquired the dress, which was in bad shape and the length of beading at the "bottom" was halfway off. They were attachd to a piece of fabric (shown at the top)& there's only about 1 foot of it left, and these come off of it easily if pulled. I also have a single one listed. Attache these behind your ears in your hair...very Stevie Nicks!